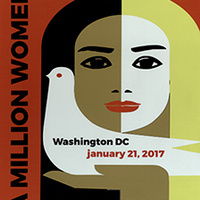 An estimated 725,000 protesters gathered in the streets of Washington for the first Women’s March in 2017. Cities across the country and around the world echoed the scene, hosting sister marches that drew an additional 4.1 million attendees. Protesters gathered one day after the presidential inauguration to voice their concerns following a divisive campaign season and the election of President Donald Trump. “Nevertheless, She Resisted” examines the Women’s March of 2017 and 2018 through posters, photographs, articles, and other ephemera. It explores the branding of a new women’s movement, the connections shared with historic movements for suffrage and women’s rights in the United States, and the ways in which this ongoing movement continues to evolve. The display also considers the counter-protesters who appeared at these demonstrations and their views. All of the items on display, both those documenting recent events as well as past protests, are part of the Lucy Hargrett Draper Center and Archives for the Study of the Rights of Women in History and Law. The Draper Center funds research in the area of women's studies and the Archives houses thousands of artifacts documenting the evolution of women's rights in the United States and Great Britain from the 16th century to present. The Hargrett Library Gallery is located inside the Richard B. Russell Building Special Collections Libraries at 300 S. Hull Street. The building is open to the public 8 a.m.-5 p.m. Monday-Friday and 1-5 p.m. Saturdays.